FFF 2015 was the sixth event in the series and attracted approximately 200 telecommunication industry experts andFFF 2015 was the sixth event in the series and attracted approximately 200 telecommunication industry experts and academics from 32 countries. FFF 2015 provided a unique discussion platform for representatives from international network operators, standards development bodies, and leading academic organizations offering two full days of technical tutorials, interactive workshops, conferences, exhibition booths, and live demonstrations. Day one started with two parallel tutorials followed by three simultaneous workshop tracks. 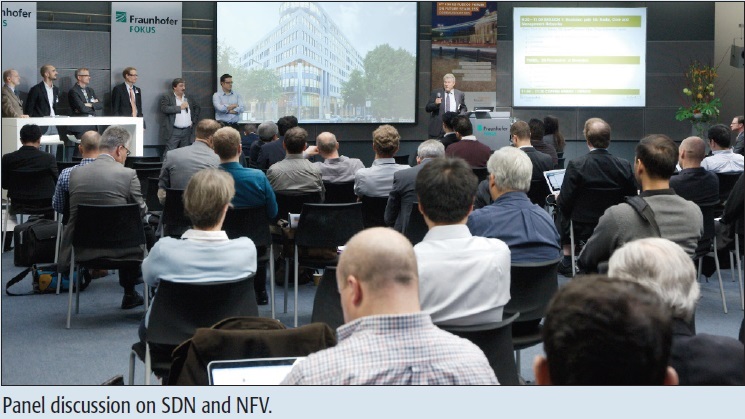 The tutorial ‘Network Evolution Towards the 5G Environment’ provided an overview of use cases and technology covering the main elements of future 5G technologies: radio, core, management, network function virtualization (NFV), and software defined networks (SDN). 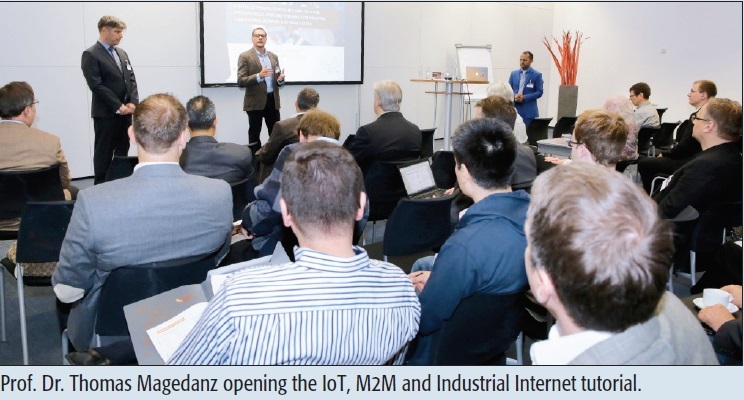 The second tutorial provided a detailed perspective on Internet of Things (IoT) and machine-to-machine (M2M), data processing, and cyber-physical systems (CPS) required for the Industrie 4.0, industrial Internet and smart cities. The first workshop, ‘Towards the 5G Environment’, was divided into two sessions, one addressing the challenges and requirements for the radio and core network, and the other addressing the latest developments and benefits from network virtualization. The second workshop covered the challenges and requirements of information and communication technologies (ICT) for Industrie 4.0, industrial Internet, and the factories of the future, as well as the enablers for ICT within the industrial environment. The third workshop addressed the evolution of IoT and M2M platforms and services for different vertical domains. The benefits of both platform types were analyzed, and it was clear at the end of the workshop that they are key enablers for smart solutions and applications. Innovative M2M and IoT solutions and applications were also analyzed and discussed. On the second day the different tracks of the previous day were united under the main theme of this year´s FFF by a full day conference entitled ‘5G Starts Now – Putting the Building Blocks for 5G Together’, which consisted of four sessions. Each session was preceded by presentations from various international network operators, vendors, academics, and standardization bodies, concluding with a panel. The topics were: ‘The Evolution Path to 5G, Including Radio, Core and Management Networks’; ‘The Impacts of SDN and NFV on the Telecom Industry’; ‘M2M, IoT and Data as Key Communication Drivers around the World’; and ‘CPS: Driving Factories of the Future’. With respect to 5G it was agreed that for its investment it is important to identify the best ways to monetize the technology and that investment in 5G should be targeted on enhancing the end user experience. This can only be achieved by the convergence of the different access methodologies. Openness will be one of the most important characteristics of the upcoming technology as long as it enables easy connectivity to APIs and innovative services. Concerning SDN and NFV, standardization is one of the key challenges that needs to be addressed, especially with respect to interoperability and network management. According to the experts, the main purpose of standardization is to avoid proprietary solutions and enhance interoperability. The panel also indicated that important organizational changes and impacts need to be evaluated. Regarding IoT, it was agreed that it enables the Internet of People and that entrepreneurs will benefit from it. IoT might be deployed without human presence, but it will require coverage. Therefore, coverage will become critical. Usability of the IoT technology for the end user, network simplification and life cycle management for IoT products will also be essential. Security, openness to service providers, and the resolution of data ownership also need to be added to the list. With respect to best practices in smart cities and Industrie 4.0 communications, the participants agreed on the importance of analytics, connectivity, and low latency to enable digital manufacturing. Alongside the workshop seven live demonstrations were made. The following technologies and technical challenges were addressed: core networks, next generation M2M connectivity and mobile edge integration in a single solution; secure connectivity for the industrial environment; cost efficient edge-cloud solutions; hands-on examples of product prototyping using NFV and SDN technologies; interconnection of virtual and physical ecosystems in the industrial Internet; combination and integration of multi-data sources in an interoperable manner; and the combination of computer vision with cyber-physical systems for industrial purposes. 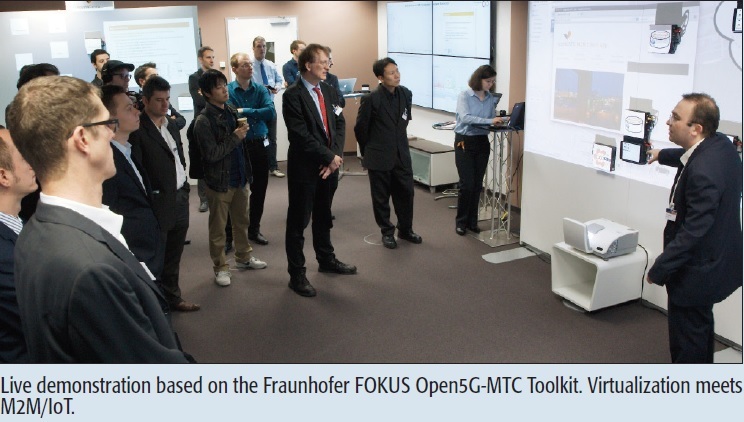 All demonstrations were based on the newest testbed toolkits from Fraunhofer FOKUS, namely Open5GCore (www.open5GCore.org), OpenSDNCore (www.openSDNcore.org), Open5GMTC (www.open5GMTC.org), OpenMTC (www.openMTC.org), 5G Playground (www.5G-playground.org), as well as the recently launched OpenBaton (www.openBaton.org), an open source ETSI NFV MANO Orchestrator. 5G is not limited to the next generation of mobile communications, but is accompanied by a paradigm shift regarding softwarization and mobile-fixed convergence. Softwarization is the major innovation and the change is taking place today. SDN/NFV and network slicing are the enabler technologies for the transformation of the network infrastructure. Programmable platforms allow for the rapid introduction of new services and business agility. Outstanding business drivers will be the vertical markets, mainly the industrial Internet.